Welcome to Kenzie's Dwarf Hotots Website! Hello from Virginia. Getting involved with rabbits started out as a family hobby, a way for us to spend quality family time together, and a way for us to meet new families who share a common interest. After much research on the different breeds of rabbits, we decided we wanted to raise dwarf hotots. Their “eyes” caught our eyes and our attention and we quickly fell in love with them. They are full of personality and each one can have a different one. We are currently members of ARBA- American Rabbit Breeders Association, ADHRC- American Dwarf Hotot Rabbit Club, MADHC- Mid-Atlantic Dwarf Hotot Club, and Quad State Area Dwarf Hotot Club. We are also Officers/Members of NVRBA-Northern Virginia Rabbit Breeders Association. After doing our research and our “homework” on Dwarf Hotots, we started attending shows in the fall of 2009 to obtain our first breeding stock. We watched, learned, and asked questions, that the other breeders were happy to answer. Our first contact was to Sally Turner, Sec/Treas for MADHC. She directed us to a few different breeders. We then contacted Joyce Holton and the Kolbs and obtained our first breeding stock. The combination of two brood does and a buck that was from the Mingus line, quickly produced grand-champions and quality show rabbits for Kenzie to bring to the show tables. Sometime after obtaining our initial breeding stock, we then added other lines in order to mold our line to the characteristics we would like to see for Kenzie’s Dwarf Hotots. We knew where we needed to make changes and continued to work hard towards our goal. We really liked what we saw in the litters that we were getting so we continued with merging the lines until we consistently saw what we were aiming for. It was nice to hear judges' comments, "very consistent breeding" from more than one judge. One of Kenzie's first shows as an exhibitor was at PaSRBA, the show of all shows, and the “Super Bowl” of rabbit shows. Our first year there, Kenzie had only shown on Saturday with three rabbits, and her first generation doe, Kenzie’s Star, K4, took Best of Breed in both youth shows that day. That became the start of our “rabbit habit” and we’ve been hooked ever since, attending shows as far north as Pennsylvania and as far south as North Carolina. At PaSRBA 2011, we met Judge Bill Whaley, with the ADHRC, and a long time dwarf hotot breeder. We had the chance to meet him and ask him a question about the bucks that Kenzie had at the show. He was nice enough to give us his honest opinion (he's very honest :) ) He became our mentor and friend. Since the start of our rabbitry, we as a family, have continued to work hard together, while having fun, to achieve quality Dwarf Hotots and to produce to the standards of perfection. Our love for this breed makes it easy to promote them. We enjoy getting new families started with the breed and helping them along the way. *The information that we share, and our thoughts and opinions, are based on our experience only. 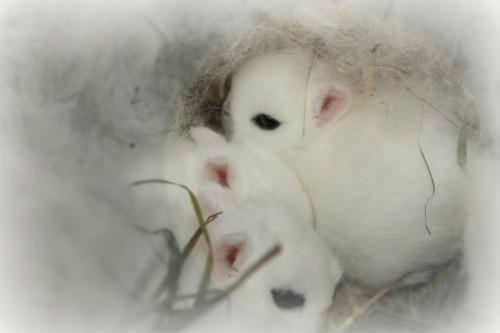 "To describe the Dwarf Hotot, it is pure white with rollback fur, body type should be short, compact and well rounded, shoulders are as wide as the hindquarters and the top line has a gentle rise. Their heads should be broad, uniform with their bodies. Their ears should be thick, well-furred and short to balance with the head. Their eye bands should make a complete narrow outline around the eye about 1/8 of an inch thick or the thickness of two pennies. Dwarf Hotots have an ideal senior weight of 2 1/2 lbs and a maximum weight of 3 lbs."